This book presents, for the first time, an in-depth and wide-ranging study of public musical life in Cork from the early eighteenth century to the end of the nineteenth century. The city�s strategic location facilitated rapid economic growth during the eighteenth century, and urban social patterns consolidated within its mercantile communities. Local professionals collaborated with touring performers in sustaining a vibrant concert life, to which military and yeomanry bands frequently contributed. Visiting theatre companies from Dublin brought professional musicians and singers, giving local audiences a taste of current metropolitan repertoire. The cathedral of St Fin Barre maintained a core of professionals who were influential teachers and performers in the city. In the politically charged environment following the Act of Union, a growing sense of Irish identity through awareness of Ireland�s past was evident in the proliferation of songs by Thomas Moore and the appearance of the Irish harp in concerts. These featured alongside excerpts from Italian opera, English glees, and the virtuosic offerings of touring composer-performers, notably Paganini and Liszt. Local press writing emerged as an important element of concert promotion. From the 1840s onwards, wider movements promoting temperance and social reform were reflected in dedicated local organisations that sponsored music education, and temperance bands and singing classes proliferated. Despite political and sectarian tensions, choral societies emerged as a key element of middle-class sociability during the late nineteenth century. Musical structures in the city�s new Catholic churches, a municipal school of music, and a new opera house were amongst the late nineteenth century developments that marked music as a vital strand in Cork�s expanding social and civic life. 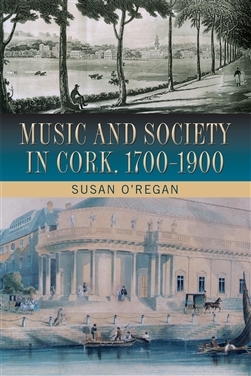 Although there has been much recent work on music in the Cork city of a more recent vintage (notably by Ruth Fleischmann, Seamas de Barra and and Joseph P Cunningham), Music and Society in Cork, 1700-1900 is the first comprehensive study of its kind to be devoted to the eighteenth and nineteenth centuries. In this respect, the book deserves to be ranked alongside Brian Boydell’s pioneering studies of music in Dublin which appeared in the late 1980s and early 1990s, not least because O’Regan’s study so handsomely emancipates Cork from its almost invariably secondary status in relation to musical developments in Dublin. Perhaps the greatest strength of this work is its originality of research. On practically every page there is brought to the surface of contemporary scholarship a figure, institution, musical event or development that is new to the discourse of Irish musicology. 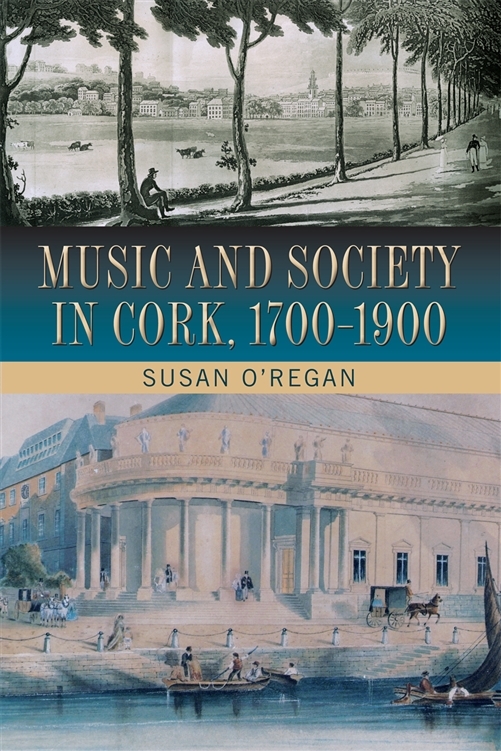 And there is also a very strong sense of discrimination between the representation of music in Cork during two centuries in all its complex detail and the prominence nevertheless of certain key individuals whose contribution to music in the city is here comprehensively evaluated for the first time. Likewise with institutions: the chronicle of concert life in the eighteenth century is memorably achieved, and so too is the remarkable and revealing disclosure of church music (of both denominations) which makes up the substance of the third chapter. I was no less taken by the intricate and yet lucid unravelling of Cork’s theatrical life in the fourth chapter, and the recovery of concert life, expressly as a result of Cork’s musical relationship with London, in the middle decades of the nineteenth century.